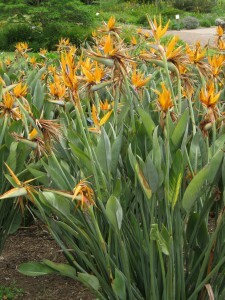 My first visit to Kirstenbosch, some seven years ago, was something of a disaster. Driving from the opposite side of Cape Town, in warm sunshine with clear blue skies; a thick sea fog swept in, turning everything into grey gloom. With plummeting temperatures, shivering in thin cotton T-shirt and shorts, my enthusiasm for walking around a large botanical garden quickly evaporated. 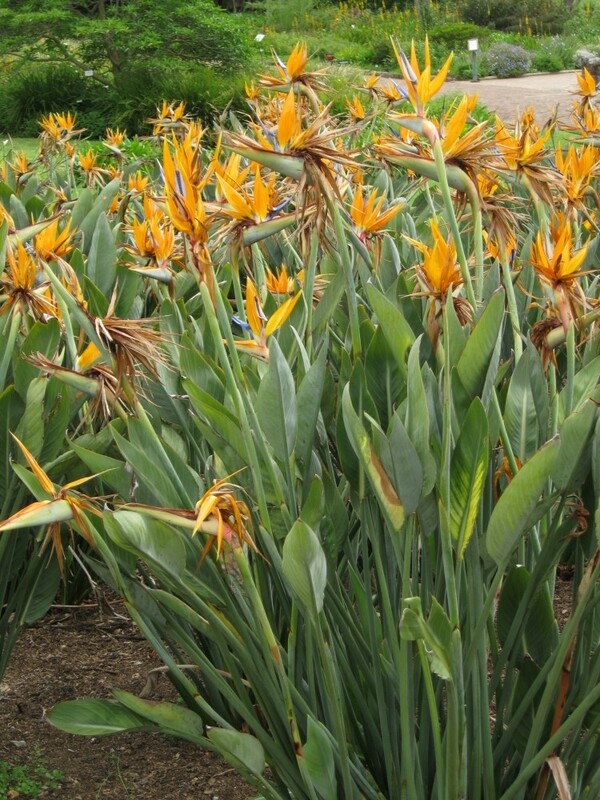 The slopes of Table Mountain behind Kirstenbosch had become a brooding, barely-visible monochromatic presence; and to make matters worse, my visit was in the dry mid-summer (January), when, apart from agapanthus, much of the flower power was spent. After 40 minutes or so, I reached a decision, rather than freeze my nadgers off, I would come back to this great garden another time. 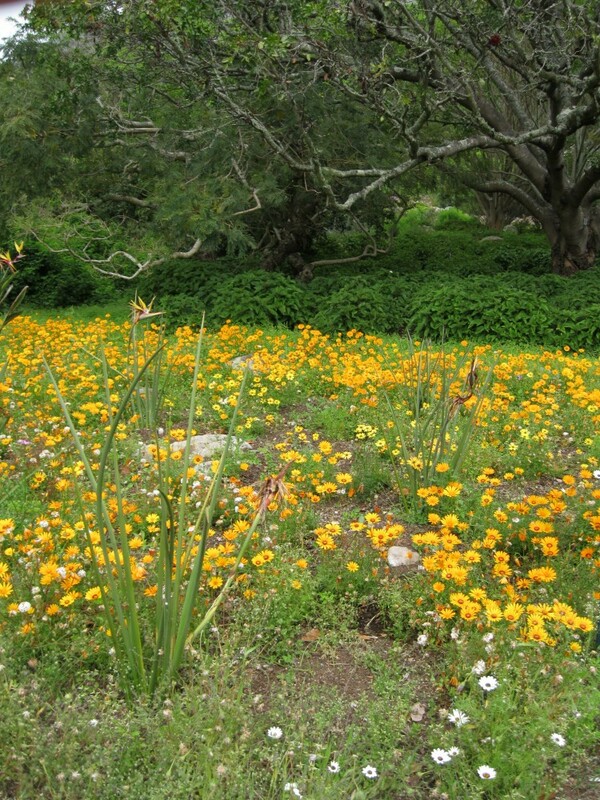 What makes Kirstenbosch special is that it does not have a world-wide plant collection, like Kew, but only the indigenous flora of South Africa. 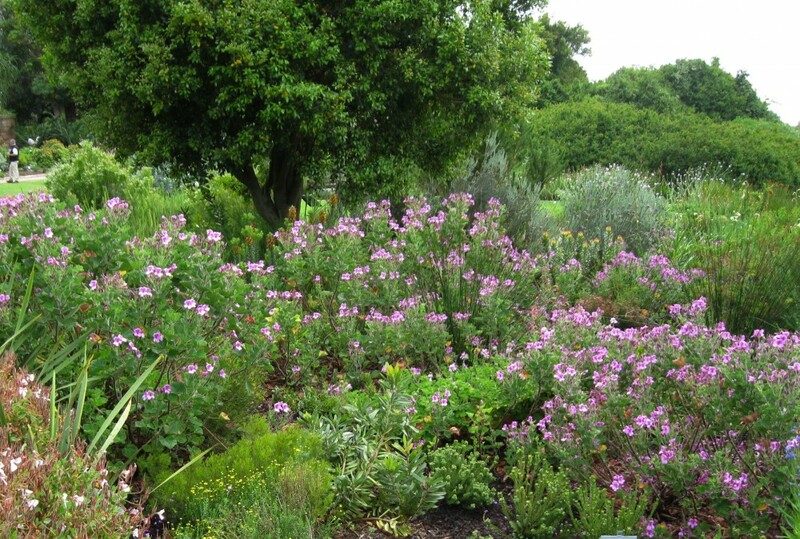 A botanical collection of native plants in Britain would be a sad little thing, but Kirstenbosch is at the heart of the one of the world’s most diverse, and unique regions of flora, the Fynbos Biome (Cape Floral Kingdom). Some 70% of the 8000 plants of the Western Cape are not to be found anywhere else. The Western Cape has given us so many of our garden plants, that to list them all, would be difficult. Fynbos, in Afrikaans, means ‘fine-leaved bush’; and the predominant natural vegetation is evergreen woody shrubs and sub-shrubs, such as proteas, heathers, and restios (Cape reeds); that thrive on the nutrient poor, free-draining sandy soils of this tiny corner of south-west Africa. 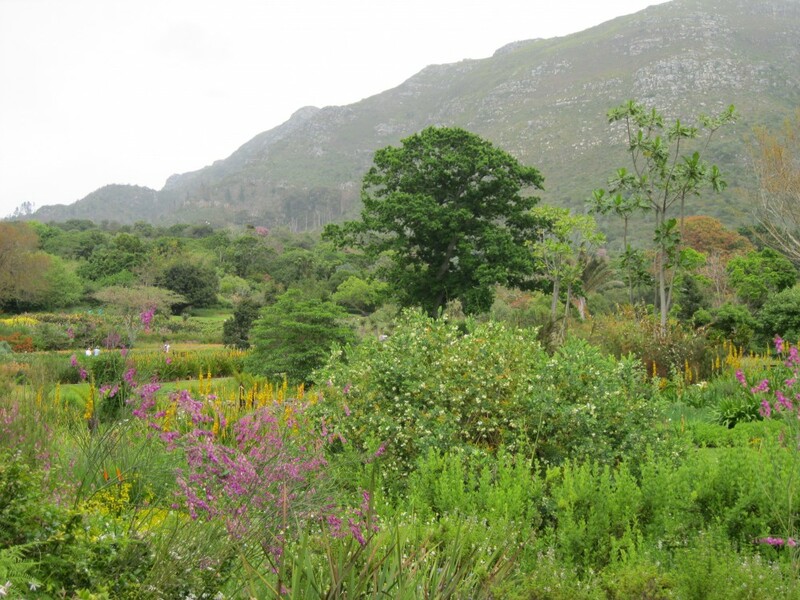 The Fynbos Biome is one of six separate plant kingdoms of this large and varied country; and in Kirstenbosch’s Conservatory are found plants from the other semi-arid and desert areas, such as alpines, succulents and bulbs. Outdoors, these would not survive the garden’s heavier winter and spring rainfall. My second visit, in late October, could not have been timed better; the fynbos was in full flower, with splashes of orange from the pin-cushion proteas, of magenta from the pelargoniums, and reds, whites and purples from over 600 varieties of heathers; the predominant evergreen foliage preventing the overall effect from being garish. 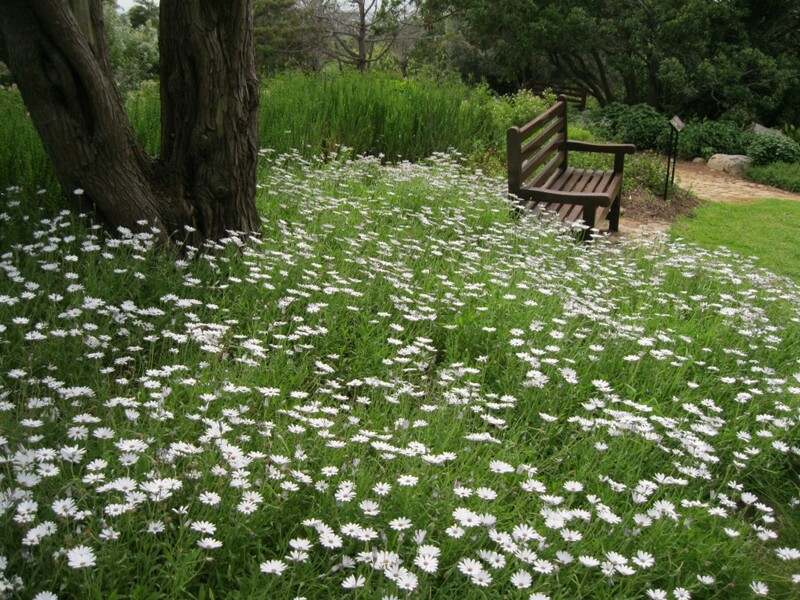 Add to that the spectacular show of colour from the large carpets of white and yellow annual daisies; and the beds of different varieties of orange strelitzias, and it is not hard to understand Kirstenbosch’s popularity. 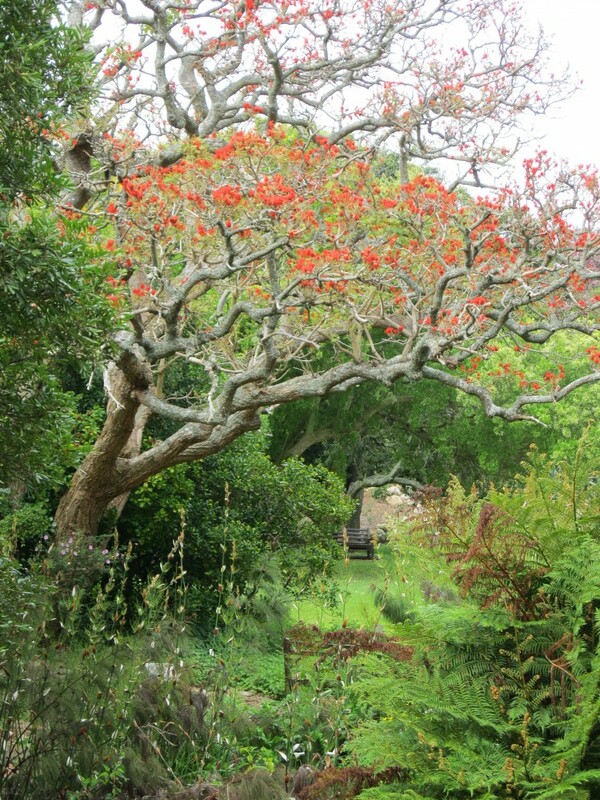 The botanical garden of 36 hectares is one corner of a 500 hectare estate that includes the forested eastern slopes of Table Mountain. In the 17th century, the lower part became a large productive farm for provisioning the passing ships and feeding the Dutch settlers; whilst the forest areas were felled for their timber, and later replanted with eucalyptus and faster growing European pines. At Kirstenbosch, and elsewhere in Cape Town, large areas of non-native woodland are now being cleared to let the native fynbos regenerate. 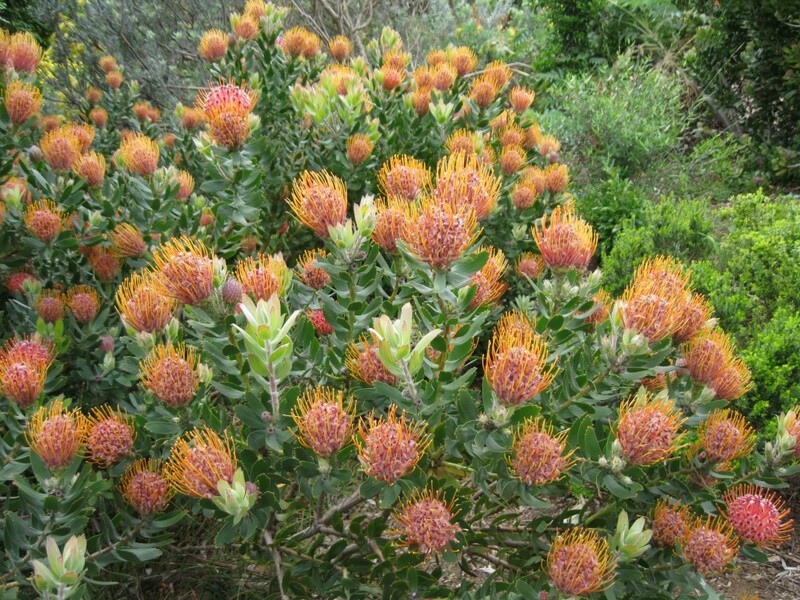 But there is a problem, many of the proteas thrive well for about 10-15 years, and then need fire to burn off the old scrub, and regenerate. In the botanical garden, these plants can be easily removed and replaced; but elsewhere, controlled burning in a city setting can prove problematical. The Kirstenbosch estate was bequeathed to the nation in 1902 by Cecil Rhodes, someone, who, in modern South Africa, is probably best forgotten. From creating the diamond monopoly of de Beers, and a second fortune from fruit farming; as a politician he was responsible for introducing acts to push black people off their land, and raising the requirements for their enfranchisement. A ruthless, and some would say, greedy colonialist, he believed the Anglo-Saxon race were destined to rule the world, a surprisingly commonly held view in this age of British imperialism. His lasting contribution to Kirstenbosch is an avenue of camphor trees (imported from Hong Kong) planted along his favourite horse ride. The botanical garden, founded in 1913, had very humble and impoverished beginnings. It is not easy to take everything in on one visit, and in my case, I passed the first two hours huffing and puffing my way round Kirstenbosch’s higher forested slopes, studying native flora at close hand, such as the beautiful and delicate wild lobelias. In the botanical garden, I spent little time in the Arboretum, with its 450 native trees, and The Fragrance Garden (where there was little in flower); but two small gardens especially caught my attention. The Garden of Weeds explains how South African plants, in other climates and soils, can become nuisances and rampant thugs. Too often, we concentrate our attention on what is threatened with extinction, when just as damaging can be the globalisation of weeds. We can always find ways to bank seeds of endangered species, and re-introduce them later; but the unchecked spread of weeds permanently changes our native habitats. The counter-balancing Garden of Extinction provides the useful contrast; bringing together some 1500 South African plants that are threatened with extinction in the near future, and what steps are being taken to avoid this outcome. These two complementary gardens impressed me, because they show us practical plant problems in our everyday world – something other botanical gardens might want to copy.. I found Kirstenbosch has a sense of cohesion that few other botanical gardens have because all its plants are indigenous species; and the majestic backdrop of Table Mountain and the panoramic views are something few others can match. 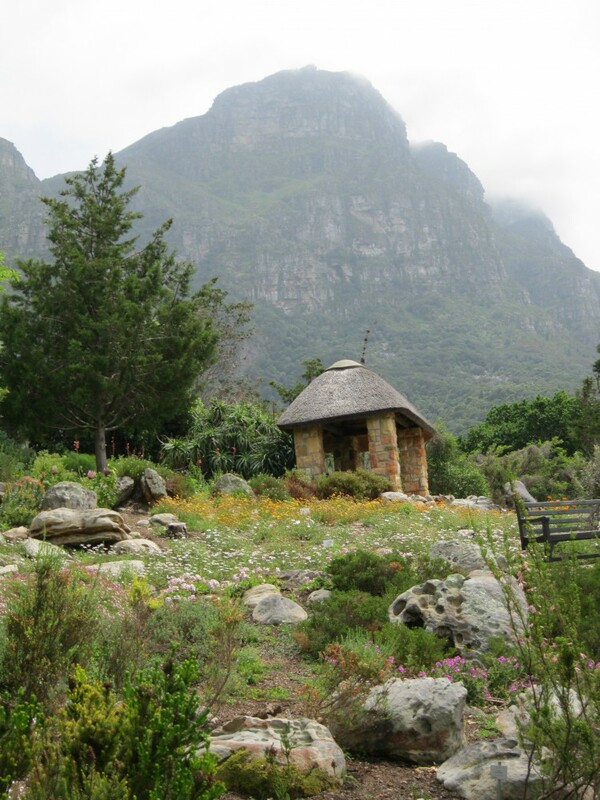 A visit to Cape Town, without a visit to Kirstenbosch is simply unthinkable.